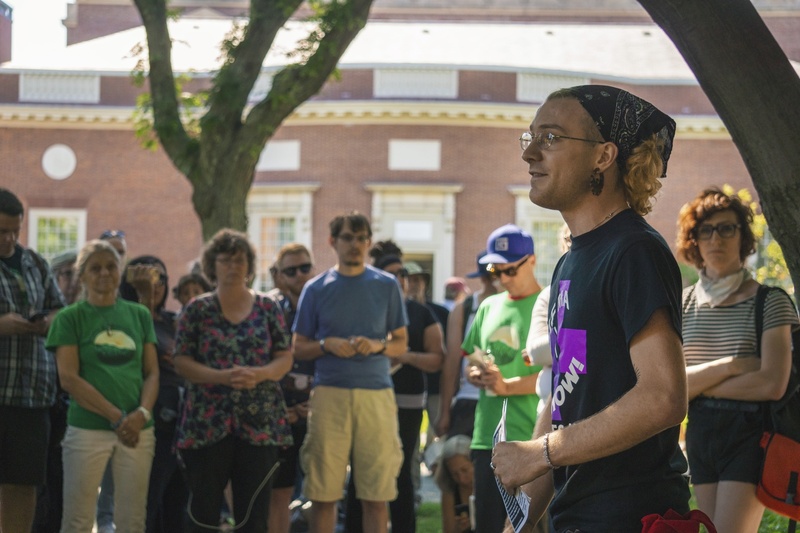 A crowd gathered in front of Lamont Library this summer to protest the Arthur M. Sackler Museum. UPDATED: Jan. 22, 2019 at 8:01 p.m.
Local activists and at least one public official are calling on Harvard to remove the Sackler family’s name from its buildings after a memorandum filed in federal court Tuesday alleged the family knowingly understated the risks of its company’s addictive opioid product. Massachusetts Attorney General Maura T. Healey ’92 submitted the 274-page court filing as part of a lawsuit the state brought against Purdue Pharma — the Connecticut-based pharmaceutical company that produces the painkiller OxyContin — in June 2018. The filings allege that members of the Sackler family, who have served on the company’s board of directors, “controlled Purdue’s misconduct” all the while raking in billions of dollars from opioid sales. 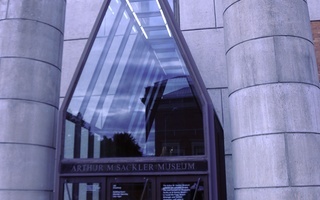 The Sackler family has donated significant sums to Harvard and helped fund the Arthur M. Sackler Museum, which holds the University’s collection of Asian, Middle Eastern, and Mediterranean art. For years, members of the Sackler family have sought to distance themselves from Purdue and its addictive narcotic, which many have blamed for its role in spurring the opioid crisis. In 2017, 47,600 Americans died from opioid-related overdoses, a rate of roughly 14.9 per 100,000, over five times higher than in 1999. But this week’s filing sheds new light on the extent to which multiple members of the family remained involved in the company and its efforts to deceive the public about the risks associated with OxyContin, even after they agreed to a Justice Department settlement in 2007. Though Arthur Sackler passed away nearly a decade before OxyContin came to market, many activists blame him for pioneering the aggressive marketing techniques that Purdue and other pharmaceutical giants would later employ to sell their addictive painkillers. Indeed, those very tactics — using throngs of sales representatives to promote opioids directly to doctors, nurses, and pharmacists — targeted Cambridge and surrounding communities in the years before the region saw a spike in overdose deaths, according to this week’s legal filing. Robert Josephson, a Purdue spokesperson, wrote in an emailed statement that the company is “committed” to working with victims of the opioid crisis. He cited educational initiatives the company has funded to warn teenagers about the dangers of opioids, as well as Purdue’s collaboration with law enforcement and its funding of state prescription drug monitoring programs. Jillian Sackler, the widow of Arthur M. Sackler, wrote in an emailed statement that Arthur M. Sackler had "nothing to do with" the opioid crisis. "It is a gross injustice to connect Arthur to the opioid crisis some 30 years after his death when he had nothing to do with it. It denies the many important contributions he made working to improve world health and to build cultural bridges between peoples," she wrote. In the wake of the most recent filing, Somerville mayor Joseph A. Curtatone, a 2011 graduate of the Harvard Kennedy School, urged Harvard and Tufts University to remove the Sackler name from their campuses in a Thursday tweet. “As a @Harvard graduate and Mayor of a city that’s home to @TuftsUniversity, I think there needs to be a serious discussion about removing the Sackler name from those campuses given the revelations coming from @MassAGO about how #OxyContin was pushed in our state,” he wrote. 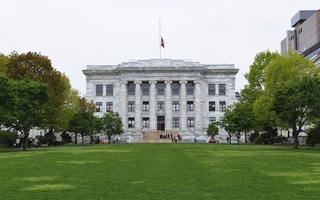 Activists also circulated an online petition calling on Harvard to “Cut Ties” with the “Makers of OxyContin.” The petition has garnered more than 250 signatures and will be delivered to University President Lawrence S. Bacow, according to the petition’s webpage. Harvard spokesperson Christopher M. Hennessy declined to comment on the calls for the University to strip the Sackler name from its campus. Also on Thursday, dozens of organizations dedicated to fighting the opioid epidemic, including Facing Addiction and Magnolia New Beginnings, gathered in Boston to discuss the ongoing legal cases against pharmaceutical companies and how to pressure these companies through activism. 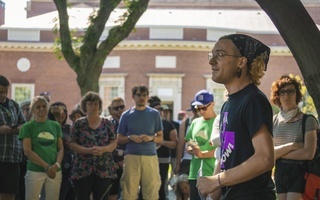 Domenic Esposito, who organized the event — called the Opioid Epidemic Accountability Conference — said in an interview he hopes Harvard will strongly consider removing Arthur Sackler’s name from its campus. “I personally think they should be reconsidering their…donor lists, especially when it comes to the Sacklers,” he said. Esposito acknowledged that universities face a “tough” decision in evaluating whether to strip a donor’s name completely from their institutions. “It’s a slippery slope because then could it be someone who is associated with Big Oil, and I mean, where do you draw the line?” Esposito said. The recent public outcry is not the first time Harvard has faced criticism for its connection to the Sackler family. Last June, more than 30 demonstrators held a “die-in” at the Sackler Museum to protest the Sackler’s connections to Harvard. Photographer Nan Goldin, whose works are displayed at the museum, led the June protest and has also previously launched a Twitter campaign to encourage the University to cut its ties with the Sackler family. A previous version of this article incorrectly stated that a spokesperson for Jillian Sackler did not respond to a request for comment. In fact, due to an incorrect email address, the spokesperson never received The Crimson's request for comment. This article has been updated to include Jillian Sackler's comment.